My main areas of interest are in applied analysis and probability. The transport of proteins and other molecular cargo in a cell is done through directed transport along microtubules. Molecular motors taxi cargo across through a “hand over hand” mechanism, in which the two motor heads on a motor sequentially attach to tubulin dimers. Several studies observe this procession in a discrete setting, and use Markov chain methods to arrive at desired statistics, such as effective velocity or diffusion. By coarse graining stepping, cargo and motor position may be described through a system of coupled SDEs. Dimensional analysis shows that equations unbound motors are fast compared to cargo, which in turn are faster than bound motors. Working with Peter Kramer at RPI, I have used averaging techniques and renewal theory to understand effective equations of multiple motor systems under random switching. This system is interesting in multiple ways. First, the gathering of statistics for grain topologies (the number of sides of each grain) is highly nontrivial. During the coarsening process, grains with less than six sides annihilate due to the Von-Neumann “n-6 rule”, which states that grains with n sides have a rate of area growth proportional to n-6. 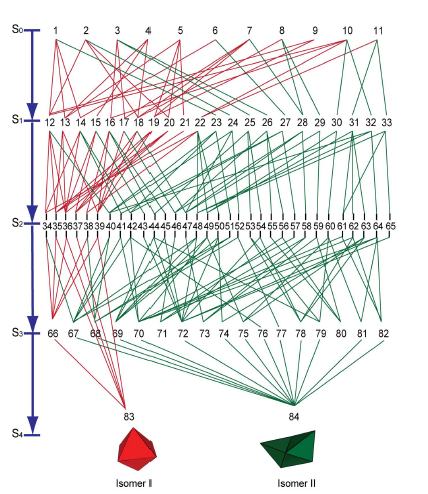 After vanishing, neighboring grains change topologies to keep the network trivalent. Left side: grains before annihilation. Right side: grains following annihilation. Note the top row of pictures, where topologies can also change due to a side collapsing. 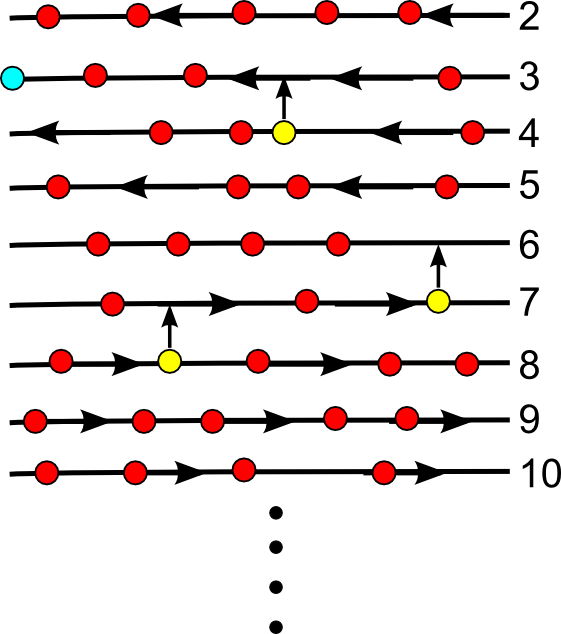 Thus, a natural clock for this system, describing the rate of topology change, is the number of deleted grains. 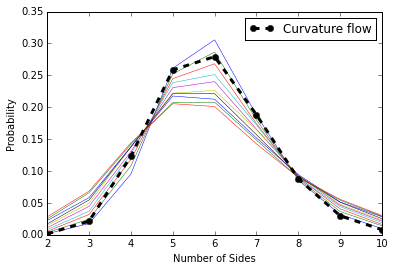 After a short time, however, something unexpected occurs: statistics of side topologies stabilize! Distribution of topology: the dotted line is the stationary distribution obtained from direct curvature flow. The solid lines show evolution of the kinetic model with an imposed diffusive term, corresponding to increased side switching. Currently, there is no rigorous proof of universality for this grain statistic. A solution from curvature flow currently seems intractable. In fact, there is still debate about how we should reassign grain topologies following the disappearance of a single grain. One common method, which converts the problem of curvature driven parabolic equations to transport equations, makes a “gas approximation”, or a mean field model where the notion of neighbors is eliminated. Most of these models are written in their final hydrodynamic limit, without addressing whether finite models approach the limiting equation, or even if the limiting equations themselves are well-posed. In this instance, a grain with three sides is annihilated. Three grains are randomly chosen to lose a side (denoted by vertical arrows). In this instance of a PDMP, a particle annihilates on species 2. By predetermined rules, three randomly chosen particles are assigned to new species. Click here for a preprint of the main paper studying the generalized “k-species model”, along with this study for a fully worked example on a minimal model on one species, which gives laws of large numbers for total loss of particles, as well as a general Glivenko-Cantelli type theorem for two-phase sampling. My first project at Brown was on the optimality of self-assembling nets. 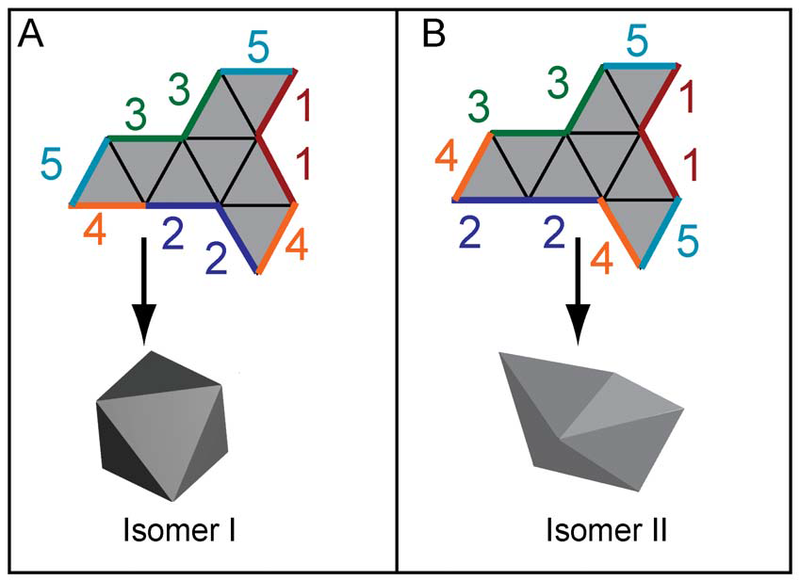 In collaboration with scientists from the Gracias Lab at Johns Hopkins University, we defined a gluing algorithm to create a configuration space of folding states. Viewed as a Markov chain, we derived a set of birth death equations which predict prevalent pathways that minimize defects. Left: The path space for an octahedron and its non-convex cousin: the “boat”. Right: a single net with multiple end states. To view articles detailing our results, click here and here. Before starting my postdoc, I spent a few years at Geisinger Health System, a hospital serving rural Pennsylvania. My work involved applying a mix of classical statistics and methods in data science to investigate popular themes in medicine, such as disease detection and patient flows. I was fortunate enough to collaborate with Nathan Ryan and several undergraduates at Bucknell University, including an REU which focused on consistency between algorithms for detecting sepsis. Here are some papers and preprints that have resulted from this time. How can you improve performance in a neural network? A simple answer is to add more edges to its architecture, the underlying topology which connects hidden layers. In this preprint, we test the accuracy of CrossNets, a neural network which allows for connections in a general directed acyclic graph, against other networks, and formally prove convergence of the network to a local minimum. This is work with Chirag Agarwal, a graduate student in electrical engineering. To measure flow between various departments in a hospital, the most common method is to define transition rates between rooms, and introduce a continuous time Markov chain to simulate the populations of patients at different times. In this preprint, to account for “activity” within a room, which may not be properly explained with Markovian methods, we use network centrality measures commonly used in research relating to social media. This is work done with undergraduate students Naba Mukhtar and Maria Cioffi. A “hospital graph”, where nodes denote departments and connections denote possible transfers between departments. The improper taking of medication is one of the main causes of hospitalization. The most common metric for measuring compliance to medication is done through taking the mean possession ratio, the fraction of total days a patient takes the proper medication. This report extends the concept to account for changing patient behavior, and also relates compliance to socioeconomic variables. Iron regulatory genes have been shown to have a close relationship with the progression of breast cancer. In this study, we show that the same set of genes has an adverse effect on survival length of patients with gliomas, a class of malignant brain tumors.